Hi Everyone! I’ve got a new tutorial for you! This beautiful blanket! I only have 1 other blanket tutorial on YouTube and it’s baby size, so I’ve been wanting to do an adult/throw size for a while now. This one is super warm and cozy, very easy to accomplish and modify and this simple color block design is modern and fun. Finished Size: 70 wide x 65 (You’ll notice it finishes wider than the foundation chain because of the weight of the yarn it stretches out). 6 skeins of size 5 or 6 yarn in each color. I used Loops and Threads yarn (sold at Michaels). Bernat Sofftee Chunky is very similar! any other thicker size 5 or 6 yarn with slight texture will give you a similar result. I linked the Bernat, so you can see what it looks like. Size Q or 16 mm crochet hook. Also known as a speed hook. 2. Chain 70 chains… or 50 inches with very little tension. -When you run out of yarn, I did not run out at the same time. Tie the 2 ends (the yarn you are using and the new yarn) and continue. Don’t forget to weave in all the little ends later. When you run out of the next skein of yarn, attache the next skein. This way the tails to be weaved in will be staggered and unnoticeable. 8. When you finish a row of color 1 and don’t have enough to complete another row, add your new color when you make your last hdc. WHen you have the 3 loops on your hook for that last stitch, add the 2 strands on your hook and pull through. Tighten everything up, chain 2 and turn continuing on like we have been. 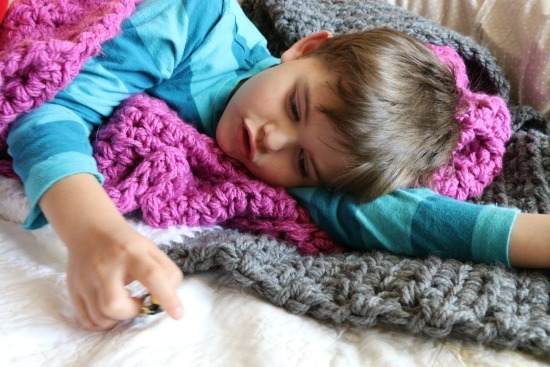 If you want to modify, this blanket is super easy to do that! You can use 1 strand instead of 2. Make sure you use the coordinating hook size for the yarn choice you have made. You can also pick a more textured yarn, more colors, less colors, bulkier or thinner! The options are endless for you to make this your own. I’d love to see pictures, so tag me on social so I can see! 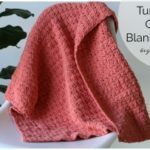 -Please note: *If you want the blanket to turn out exactly like mine, you will need to use the exact same yarn and hook and foundation chain size that I do. WARNING TO PARENTS: As soon as you say it’s ok to cuddle with the blanket, your kids will claim it as their own and play legos in it…. even though it has purple, my son says ;). And when kid leaves the room, cat will claim it. I’m telling you, we live in SoCal… we are not cold, and this blanket was a hit!!!! (It’s now 2 hours after I took this photo and the cat hasn’t moved a muscle lol). Let me know what you think …. and Happy Stitching! I’m new to crochet and was hoping you could help me. 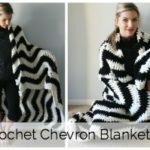 I really love this blanket tutorial and would love to make it for someone for Christmas. 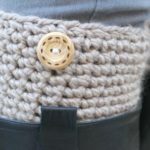 However, I’d really like to try making it with one strand of yarn instead of two. I plan on using the same size 6 softee chunky Bernat yarn that you suggested. I was wondering what size hook you would recommend for that and how long to make the foundation chain then? I have just finished my blanket in Sea Blue, lime green and white, and it looks lovely. Thank you for the tutorial Melanie. i wish I knew how to post a picture. I made mine substantially larger, to fit our double king bed, so it is heavy, but the kids were under it within minutes of being done. Of course, my very favorite is mr. Fox!! Perfect for new baby granddaughter’s expecting in August! So, with my most Favorite instructor guiding me with the best videos I’ll need to get to it! Hey I’m having a hard time finding the right purple color and the right sizes. I looked at the link you provided, but no luck. Could you maybe point me in the right direction. Thanks so much! Hey, I would absolutely love to start this blanket, but I’m having a hard time finding the size yarn I need, and not sure what the name of the purple you use is. If you could just get that name to me that would be fantastic. Thanks so much. OH and I did look at the link you provided. So if its on there, it might just look like a different color on line vs in person. Just curious but can you use any yarn? I would like to make this with the Bernat baby blanket yarn. Thank you in advance. If I am using the same yarn (loops and threads charisma) but only one strand instead of two, and using same size huge hook (to make it still bulky), how many do I chain, and how many balls of yarn do you think it will take? TIA!!! Hi Melanie! I’m having a bit of trouble figuring out how much yarn to buy for this? in the video you mentioned 18 balls of yarn so do I need to buy that many? I’ve noticed as well that on some skeins they say 3 balls or 2 balls on the package. I’m still new to this and this is going to be my next project so is there any way you could possibly break this down for me? thank you for all of your awesome tutorials!!! Melanie – what would you to make it a king size afghan? I love this and made one and now I can’t stop making them!!!! HI MELANIE, I NEED YOUR HELP.i’M HAVING TROUBLE WITH EITHER ADDING NOT ENOUGH OR TOO MANY STITCHES AT THE END OF THE ROLLS. IS THERE AN EASIER WAY. MAYBE BY MARKING THE LAST STITCH WITH A LITTLE CLIP OR SOMETHING OR MAYBE COUNTING THE STITCHES. IS IT ALWAYS A COUNT OF 70? How many yards was each color? And what were the oz of each skien you used? 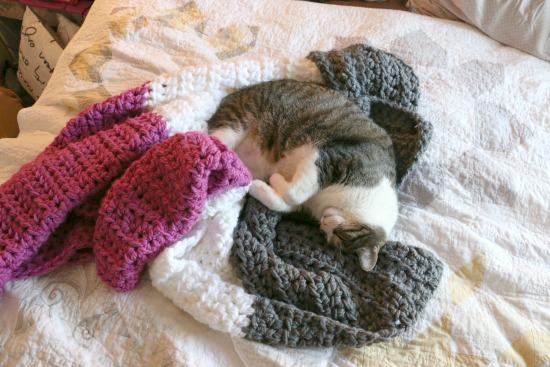 Thanks you I am really enjoying making this blanket !!! Hi, I am new to crochet, the teacher I work for is brilliant and got me interested. I have only completed 2 projects, 1st was your baby blanket and I have just finished your colour block blanket. I made some changes. I am very happy with it as is my daughter how has stole it!!!! My problem is I’m running into trouble at the end of each line. I’m not exactly sure where I am supposed to but the hdc in the turning chain (except for the 1st one on on row 2/3) I either lose stitches or gain. I plan on doing another for my mother for her birthday and want it to be absolutely perfect . Can you help me, please!!!!!! I think you are extremely talented and I am in awe of your talent. I will continue to search for your tutorials. What is the type of Loops and Threads yarn? There are lots of different varieties on Michael’s website. It is loops and threads Charisma. Unfortunately Michaels does not allow people to buy it online anymore, but they still sell it in stores. I am going to attempt to make this afghan, it will be my first, and was able to buy the Loops and Threads Charisma yarn online from Michael’s. In fact, it was $2.50/skein! How many yards total for each color is needed? Hi Melanie …I’m from Scotland can you please tell me what kind of yarn you used and what size of hook ..( uk ) size please ….your blanket is Gorg…I’m going to give this a go…thank you. Can I use the Q hook with medium 4 yarn?? I love this blanket, but would like to make it bigger, what us the multiple so I can make a longer chain? Wow, this is awesome! So going to do this! This is exactly what I have been looking for…easy, fast, big, and bright! I need a “thank you” give for a co-worker who is helping me with my taxes and I think I can finish this blanket by then! Thank you. You’re a great teacher. Thanks for doing what you do bc I’m having fun following along. My question is – Can you post a mitten tutorial? The others I’ve watched aren’t as easy to follow as your videos are and I can’t seem to get it right. Winter on the east coast will be long over by the time I figure out how to make mittens for my kids. Ha! Thanks so much. This is very cute and I love the thickness of it… But the color.. I think maybe solid or mixed up rows would be very cool … Too..
I’m so excited to make this. I’m new but I’m sure I can do it. My son is adopted from Guatemala and I think I’ll make one for him using the colors of their flag! Thank you so much!! Loved this tutorial! I can’t wait to get started on this project! !